RTLS is more than a way to “find your stuff.” Healthcare is beginning to view Enterprise Location Services as a valuable utility, enabling new workflow efficiencies and improvements to patient care. Selecting and deploying a Real-Time Location System may seem like a daunting undertaking. Every facility has its unique array of pain points, and no individual RTLS solution is likely to address each of them with equal effectiveness and efficiency. The complexity of locating assets, protecting patients and staff, as wells as sensing and measuring environmental conditions requires a combination of diverse technologies. 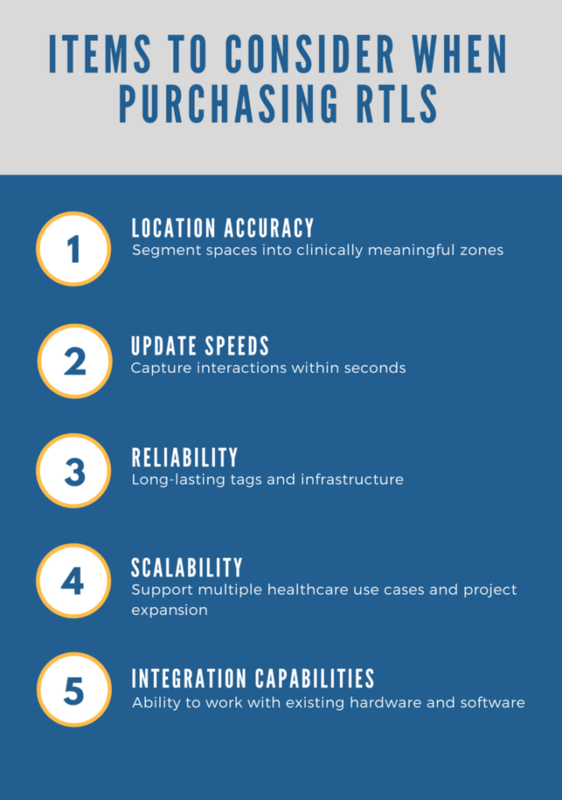 Across a healthcare organization, varied applications for RTLS require unique technologies from simple estimated location all the way through to Clinical-Grade room-, bed-, bay-, or chair-level requirements. For example, if the clinical engineering department needs to find a medical device to perform preventive maintenance, a zone-level resolution is likely sufficient because little urgency is involved. However, if the objective is to capture location information to automate clinical data entry into EMRs or Nurse Call systems, then room- or sub room-level resolution will be needed. Ideally, the RTLS solution should not only meet the requirements for the current problem, but be flexible enough to grow from location tracking to contextual awareness. Location accuracy: Certainty-based location data with the capability of segmenting spaces into clinically meaningful zones such as patient rooms, beds, bays, nursing stations, hallway segments and other relevant workflow areas. Within a healthcare setting estimated location “within a few feet” is often not precise enough for many workflow applications. Update speeds: An RTLS solution should be capable of capturing interactions between equipment, patients and staff within seconds to facilitate the accurate collection of clinical milestones. Reliability of tags and infrastructure – Devices and tags should be equipped with long-lasting batteries to ensure consistent operability. At-a-glance visibility to overall system health as well as proactive notification of batteries that need to be replaced help to ensure continuity of data delivery. Scalability: The flexibility for one universal platform to utilize a combination of technologies (i.e. Wi-Fi, Second Generation Infrared, Low Frequency RF, UHF Active RFID, Bluetooth Low Energy, etc. ), and support multiple healthcare use case, future-proofs the facility’s RTLS investment and maximizes ROI. The installation of RTLS infrastructure should not cause service disruptions with excessive hardwiring resulting in a temporary loss of patient care areas or the need to deploy costly infection prevention measures when expanding to other floors and units. Integration capabilities: Integrating with other systems is a big benefit to a location technology platform. Healthcare facilities are full of independent systems operating in specific departments or across the entire facility. The best RTLS systems work with existing hardware and software making it easier to parse together all of the data needed to make informed decisions.